BEVERLY HILLS, Calif. – The finest known example of a saber-tooth tiger skeleton and a hefty Australian gold nugget are expected to reign over an imposing lineup of ancient fossils, meteorites and mineral specimens in I.M. Chait’s May 4 Important Natural History Auction in Beverly Hills. Finest and most-complete extant example of a saber-tooth tiger skeleton, 67 inches long, origin White River Badlands, South Dakota. Estimate $250,000-$300,000. I.M. Chait image. The 67-inch-long tiger skeleton (Lot 326) represents a fearsome predator that once menaced the animal kingdom of South Dakota’s White River Badlands. It heads the zoological portion of the sale with a $250,000-$300,000 estimate. An outstanding skeleton from a massive woolly rhinoceros (Lot 325) dates to the Pleistocene Epoch of the Quaternary Period. It is believed that giant woolly rhinos roamed the wilds of Siberia during the last Ice Age and developed their thick coats as a defense against the brutal climate. The impressive skeleton in Chait’s sale measures 177 inches long and 72 inches high, and is, in the truest sense of the word a “museum-class” specimen, having previously been part of the Kashiwagi Museum Collection in Japan. It carries a pre-sale estimate of $90,000-$120,000. Another exciting auction highlight is the skull of an extremely rare giant dire wolf (Lot 324) from the Rancho La Brea Formation, ex George Lee Collection. Scientifically classified as Canis dirus, the now-extinct dire wolf once inhabited Kern County, California, where tar pits similar to those at the La Brea site in Los Angeles proved a fatal attraction to indigenous beasts. “The tar pits were covered in water and would trap unsuspecting animals who mistook them for benign ponds,” said Chait. “Skeletons of mastodons, mammoths, horses and bison have been found at California’s tar pits, but a dire wolf is an especially rare and desirable find.” The skull offered in the May 4 sale represents the largest end of the spectrum, size wise, for a dire wolf. It measures 12 inches long by 7 inches wide by 5¼ inches high, and is estimated at $60,000-$80,000. Posed as though navigating the waters near its native Morocco, the skeleton of a marine reptile known as a Mosasaur (Lot 295), Late Cretaceous Period, exhibits an elongated, streamlined body and broad, flexible tail. Considered the closest ancient relative to today’s snakes, it grew to lengths of 10 to 60 feet. 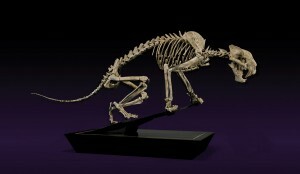 The skeleton is a first-class example that measures 59 inches long by 43 inches high. Estimate: $50,000-$60,000. Lot 296 is a toothy tableau consisting of a Mosasaurus skull with a vividly colored 13¼-inch ammonite positioned in its jaws. The gaping mouth, with its array of spiky upper and lower teeth, provides a stark reminder of why the Mosasaurus species was so widely feared 65 million years ago. The 32-inch-long skull of a reptilian creature many times the size of a modern-day great white shark was “wired for intimidation,” Chait said. The double-fossil display of skull with ammonite could make $30,000-$38,000 at auction. Other fascinating animal fossils include the rare skull of an ancient South American penguin (Lot 281), est. $2,500-$3,500; a baby Triceratops skull (Lot 311), est. $25,000-$35,000; and the large, powerful-looking tail of a Hadrosaur (Lot 303) in whip-like pose, est. $20,000-$25,000. An extraordinary fossilized Rhamphorhynchus muensteri, or pterodactyl (Lot 312), documents one of the first vertebrates to make the transformation to flight. Wings are clearly present on the form of its hollow-boned, lightweight body captured within a limestone slab. Estimate: $70,000-$80,000. Many collectors jump at the chance to acquire distinctive parts from prehistoric animals. Several outstanding entries in the upcoming sale would fit the bill nicely, starting with the brow horn of a Triceratops horridus (Lot 306) from the Hell Creek Formation in South Dakota. An immense 33 inches in length on an ebonized metal display stand, it is expected to attract a top bid of $10,000-$12,000. A well-preserved Tyrannosaurus rex tooth (Lot 307) is estimated at $10,000-$12,000; while a nicely delineated Raptor claw (Lot 310), 65-68 million years old, could scratch up $2,000-$2,500. 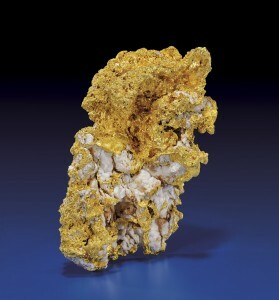 Gold nugget with natural quartz containing 3100g (99.67 ozt) of gold, origin central Victoria, Australia. Estimate $275,000-325,000. I.M. Chait image. The precious gems section could not have a more regal centerpiece than the exquisite marine-life chess set (Lot 97) designed by gemologist and jewelry designer Sylvia Quispe, Idar-Oberstein, Germany. Truly the crème de la crème of chess sets, its 32 playing pieces replicate sea creatures crafted from rich purple Tanzanian rubies and royal blue Afghan lapis with solid 18K gold. The ruby pieces are mounted on Peruvian pink opal seashell and starfish bases, while those of lapis are raised on quartz. The playing board is, itself, a work of art, with alternating squares of quartz and black obsidian. The set is housed in a handsome mahogany box. Fit for a king – or modern-day kingmaker – this masterpiece of uncompromising quality is estimated at $150,000-$170,000. Mineral specimens are led by a sensational gold nugget with natural quartz (Lot 23) that was discovered in the Australian state of Victoria. The intense yellow color of the metal denotes an exceptionally high carat content, and its gold content, alone, weighs in at a robust 3100g (99.67 ozt). Exceptional by any standards, it could realize an auction price of $275,000-$325,000. A premier example of a Canadian iridescent ammonite (Lot 271) from the Bearpaw Formation, Southern Alberta, Canada is a biogenic gemstone that would top many a collector’s wish list, this 17in ammonite gleams with electrifying colors and could fetch $38,000-$45,000 at auction. Another mineral highlight is a large, complete meteorite (Lot 220) from the famous fall at Campo del Cielo, Argentina. Weighing approximately 78.4kg, it is estimated at $18,000-$22,000. Among the more curious items on offer are an ancient mummified foot from Middle Egypt (Lot 200), est. $5,000-$7,000; and a collection of naturally colored and fossilized dung (Lot 300) from the Wilkes Formation in Washington state. Consisting of five excellent dung specimens ranging in color from gray and woody brown to burnt umber, deep purple and red, the group lot is entered with expectations of making $2,500-$3,500. From big cats to woolly rhinos, I.M. Chait’s 326-lot May 4 auction has the prehistoric category amply covered with an expertly cataloged selection of fossilized skeletons and skulls. With the addition of pulse-quickening minerals, gems and several natural oddities for good measure, it’s shaping up to be an event that will fascinate connoisseurs and evolving collectors, alike. I.M. Chait’s Important Natural History Auction will take place at the Chait gallery on Saturday, May 4, commencing at 1 p.m. Pacific Time. The gallery is located at 9330 Civic Center Dr., Beverly Hills, CA 90210. All forms of bidding will be available, including live via the Internet through LiveAuctioneers.com and Artfact.com. For additional information, call 1-800-775-5020 or 310-285-0182; or e-mail joey@chait.com. Visit the company online at www.chait.com. BOULDER COUNTY, Colo. – For their March 1 auction titled “Antiquities, Ancient and Ethnographic Art,” Antiquities-Saleroom.com decided to think big – as in dinosaur big. Coming on the heels of their highly successful Feb. 1 auction, Antiquities Saleroom’s latest auction offers the biggest piece ever offered by this Colorado antiquities company. Lot #3 is a nearly complete dinosaur fossil skeleton of a Psittacosaurus measuring over a full meter in length and half a meter in height. Far from the only prize piece in this 260-plus lot auction, this 140-million-year-old fossil, estimated to fetch a dino-sized $10,000, is just the beginning of what’s in store. According to Teresa Dodge, managing director and co-founder of Antiquities-Saleroom.com, the March 1 auction includes more than 260 authentic examples from ancient cultures all over the world, as well as several interesting fossil and mineral specimens. “We’re really excited about this latest auction. Unlike our February auction that featured Pre-Columbian antiquities exclusively, this sale literally has something for everyone,” said Dodge. S he pointed out that the March auction showcases almost two dozen ancient examples from Egypt, more than 30 pieces from ancient Greece, including a fine Attic / Athens-made pottery wine jug (lot #32) estimated to hit $8,000 to $10,000, and a large number of Roman artifacts, including examples in stone, bronze, pottery and glass. There are also many fine examples from Asia-Minor, including the largest and most complete cuneiform tablet Antiquities-Saleroom has ever seen or offered and many more exceptional examples of ancient and near-ancient Chinese / Far East antiquities, as well as more than 65 lots of Pre-Columbian artifacts. Bob Dodge, Teresa’s husband and also a co-founder in the company, stresses that all items offered by Antiquities Saleroom have been legally acquired, are legal to resell and are unconditionally guaranteed to be authentic and as described in the catalog. “We do not sell replicas or anything ‘in the style of’ any ancient culture. What’s more, no sale is ever final. We want satisfied customers who are happy with what they buy – so they will come back and buy more.” Dodge said. Antiquities, Ancient and Ethnographic Art Auction will start at 10 a.m. MST, noon Eastern, on Friday, March 1. Bids may be placed through a variety of methods – absentee (including absentee online), by phone (by prior arrangement) or live on auction day through LiveAuctioneers.com. For additional information about the auction or about upcoming auctions, call Teresa Dodge directly at 720-502-5289, send her an email at antiquitiessaleroom@gmail.com, or visit the company’s website www.Antiquities-Saleroom.com.